Photo found online, credited to photographer Todd Henson. I've been watching birds a lot lately. Many mornings I'll sit out back with the dogs and drink my morning hot beverage—cider, hot chocolate, sometimes coffee. And since most other critters disappear in the winter, I find myself watching the birds. 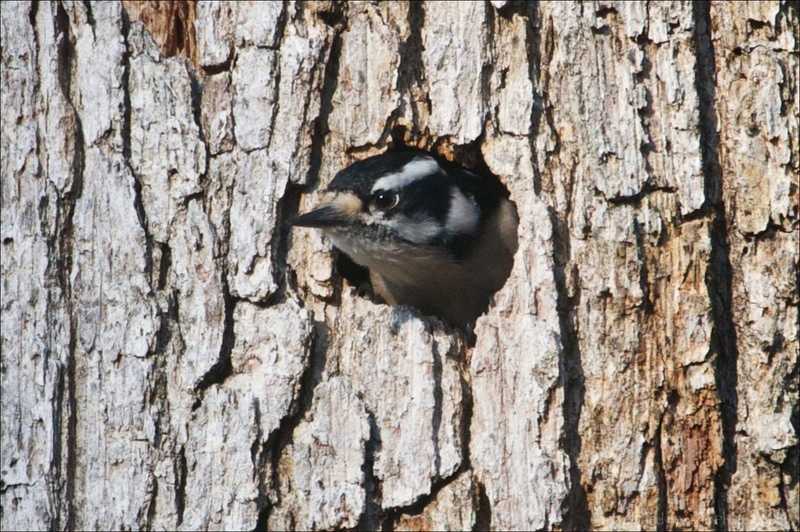 This morning I noticed a downy woodpecker carving out a nest in my tree stump. 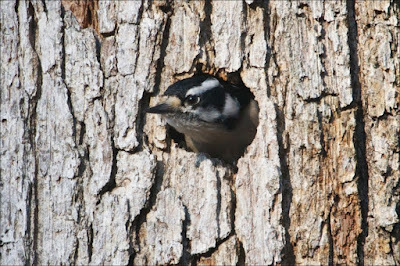 Of course I didn't know it was a downy woodpecker until I googled around. And I learned the bird is a she, because males have red on their heads. And, apparently, the males keep the females from foraging in the most productive spots—small branches and weed stems—and leave them to forage in tougher spots, such as large branches and trunks. But that also shows just how impressive the females are. This particular gal had excavated a small hole in a large tree branch that went deep enough for her to disappear inside, turn around, and come out again. Not sure whether she was in there feeding on larvae and things, building a nest or both. The male might have helped if it is a nest, but she was the one doing the work today. Watching her excavating the hole made me think about how impressive birds are. Birds see colors invisible to humans. They also see in the ultraviolet spectrum. Their eyes are relatively larger than humans', so they see better than we do. And an eagle's vision is up to eight times stronger than a human's. Then there are the murmurations of starlings, swarming in incredible unison, responding to each other as a group, rather than as individuals. Birds of many species can fly hundreds of miles away for the winter, only to find their way back to the exact spot year after year. Flamingoes mate for life, staying with their love for as many as 50 years. Female ostrices will care for another female's eggs. A falcon can fly at more than 100 miles per hour. An albatross can soar for up to six hours without flapping its wings. And a parrott can amass a vocabulary of 800 words—significantly more words than our president can speak. With a few exceptions, birds can achieve feats way beyond our ability. In fact, most animals possess qualities beyond human capability. A dog's capacity for unconditional love is certainly superior to a human's, for example. So as I observe animals, I wonder what makes us "more evolved?" Some say it's our ability for speech, but why is that more evolved than communicating without it? Some say it's our ability to reason—rational thought—but many predators certainly display the same kind measured thought. Of course, you'll often hear it's our opposable thumbs, allowing us to build and do fine work. I don't see many animals suffering without that ability, however. They all find food, water and shelter easily enough. So, beyond the enormous egos that make us believe we are superior—the same egos that imprison us in ways that other animals aren't hindered by—what is it really? Is it our ability to kill and destroy? Does that make us more evolved? I doubt it. As I sat outside for an hour the other morning observing the birds, I noticed a small group of mourning doves perched on the utility wires the entire time, seemingly just gazing out into the beyond. They clearly had more time and freedom to enjoy the view than I. Plus they can store thousands of seeds in their throats, live off of seawater, and not for nuthin', they can also fly. There are many benefits to being human. I'm not saying there are not. But being human can be emotionally painful and just far too damned difficult much of the time. Our "evolved" brains torment us far more than we fully know. So sometimes as I watch the birds, I wonder how much easier life would be if our brains were smaller and less troubled, we could see things humans can only imagine and, with a few flaps of our wings, we could catch a breeze and soar far above the cares of "more evolved" world, perch someplace entirely different, and enjoy a whole new perspective on life.